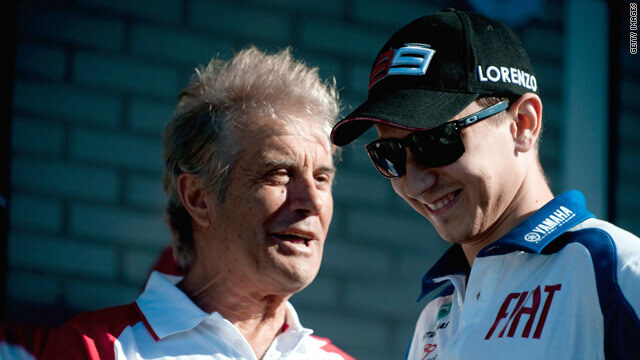 Lorenzo shares a moment with former motorcycling great Giacomo Agostini. (CNN) -- Title leader Jorge Lorenzo of Spain claimed pole position for Saturday's Dutch MotoGP with a dominant display in qualifying. The Yamaha star is 37 points clear in the championship race and taking full advantage of the accident which has sidelined his teammate and reigning world champion Valentino Rossi, who has a broken leg. He clocked one minute 34.515 seconds for the 4.542 km circuit at Assen to edge out Randy de Puniet, who finished second on his Honda. Australia's former world champion Casey Stoner was third fastest on a Ducati in a tight qualifying session that saw the top 10 separated by less than a second on Friday. "I'm very happy to take my second pole of the season but I feel even more comfortable and confident because I've been first in all three practice sessions, despite the other riders pushing hard during qualifying," Lorenzo told the official MotoGP website. "I think tomorrow's race could be interesting and of course I want to try to win, but as always the main goal is to finish and take points. I will try to escape but if I can't I will fight for the podium." Lorenzo's victory at Silverstone last weekend was his third in five races, with two second places, taking his points tally to 115. Italian Andrea Dovizioso is second on 78 and Spaniard Dani Pedrosa is third on 73. They claimed sixth and seventh fastest respectively on Friday. Up and coming Ben Spies was fourth, just ahead of fellow American and 2006 world champion Nicky Hayden.